Fixmart has supplied the main ductwork contractor at Principal Place in Shoreditch with their ongoing store requirements for the project. 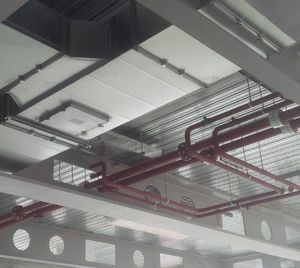 Fixmart has supplied the main ductwork contractor at Principal Place in Shoreditch with their store requirements such as Access Doors, Slotted Channel, Butyl Rubber Gasket, Universal Duct Clamps, H Frame Feet, Duct Sealant, Phenolic Strip, Foil Tape, Studding, Lindapters, Nuts, Screws, Square Plate, Rivets etc. The Principal Place development is owned by Brookfield Property Partners a global real estate company focussed on operating best-in-class office, retail and industrial assets. Shoreditch has undergone a transformation in recent years to become a vibrant London hub and projects such as Principal Place will help continue that trend.